When we saw blood oranges available at our local grocery, we immediately grabbed a couple and decided to make this. The darker flavor of the blood orange works very well with this sauce. However, you can substitute regular oranges, or even use a few different types; I particularly enjoyed using a tangelo and a blood orange for the sauce of one meal. One thing I learned to my dismay when we made this for dinner the other night is that when you start a new jar of chili paste, it’s much, much stronger than the old jar that’d been hanging around for a while. I put in my original recipe’s amount and we just about choked on the spiciness. So, be careful with the chili paste and add only enough to bring it to your desired level of heat. Toss chopped protein with cornstarch in a small bowl, set aside. Whisk together juice, soy sauce, honey, vinegar, chili paste in a small dish. Set aside. Heat oil in large skillet over med-high heat. Add minced garlic and ginger, stir-fry for 15 sec until fragrant. Add the cornstarch and protein mixture, stir-fry for 3 – 6 minutes, depending on how long the protein needs. Figure about 3 minutes for shrimp or tofu, 4 – 5 for other meats. Add the juice mixture. Cook for 2 minutes or until sauce thickens and the protein is fully cooked, stirring frequently. 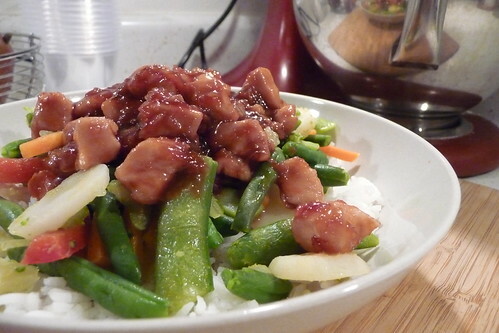 Garnish with green onions and serve over stir-fried vegetables and rice. This entry was posted in asian, dairy-free, gluten-free, Meat, recipes, sauce, untranslated, vegan, vegetarian. Bookmark the permalink.